A mob of people in an Indian village have brutally attacked an elephant and her calf, hurling firebombs at the pair after they wandered onto farmland. 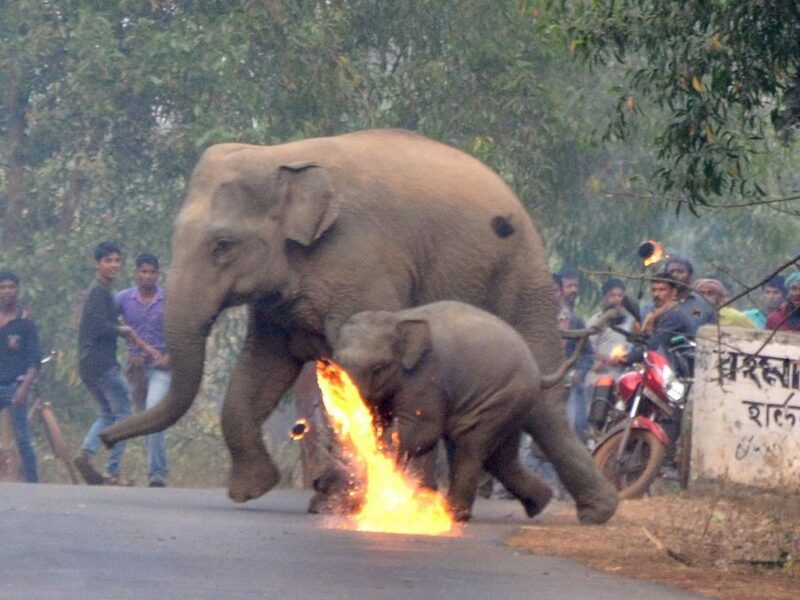 Photographs show the two elephants crossing a road fleeing a group of men who are launching flaming missiles at them. The incident, in the village of Bishnupur – a remote settlement in West Bengal – appears to be part of an increasingly common phenomenon in the country where elephants were previously been regarded as a cultural icon. But soaring deforestation in India has left wild animals with less space to live and is increasingly driving them into conflict with humans. The images, taken by photographer Biplab Hazra, highlight the extraordinary level of violence the endangered species faces as they try to survive in smaller, more fragmented habitats. Herds of elephants can cause significant damage to crops, impacting people’s livelihoods. 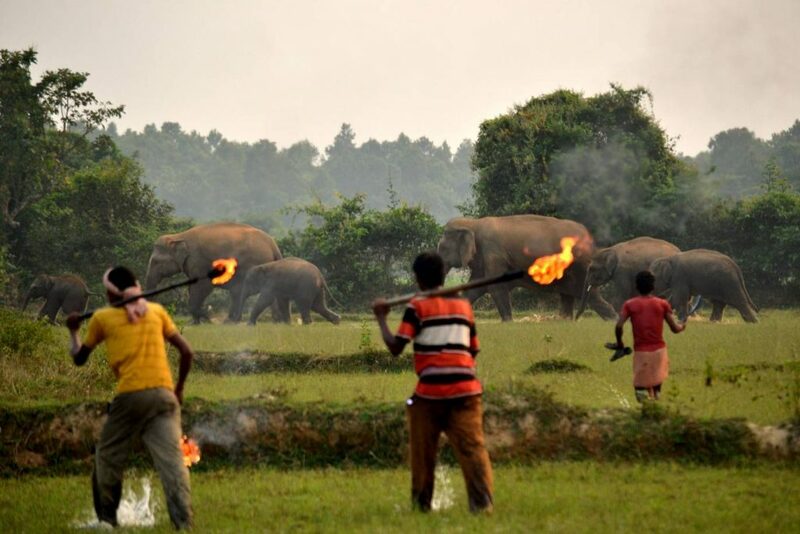 Some farmers use flaming torches to frighten elephants away from inhabited areas. “This happens because the villagers have to save their crops,” Mr Hazra told Caters news agency. The large animals need to spend up to 19 hours a day feeding, and produce about 220 pounds (100kg) of dung a day. Despite people being determined to drive elephants away from crops, the animals’ dung is a key means of spreading germinating seeds, and they play a crucial role in maintaining the integrity of forests and grasslands. Indian elephants are listed as an endangered – one level above being critically threatened. Their wild population has fallen by over 50 per cent since the 1940s. Tigers are also facing similar pressures. India’s booming human population and mushrooming towns and cities have seen forests shrink to become isolated islands, and when animals attempt to move between them, they are increasingly coming into conflict with humans.